Some hotels and other meeting space venues don’t allow you to use tape on the walls, which generally rules out the ability to post flipcharts around the room. Several years ago I stumbled upon a solution to this. Flipchart-sized plastic sheets that can serve as a cross between a white board and a flipchart have been a savior for me on several occasions. 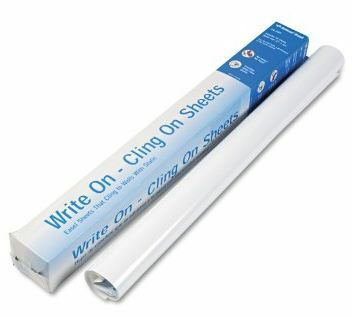 They stick to the wall using the power of static cling – no tape, no irritated conference facility staff. As much as I love Mr. Sketch markers, they actually are one of the worst things you can use when you write on these plastic sheets. You’ll need to use either dry erase markers or something extremely permanent (like chisel-tipped Sharpies). Bringing a package of these along takes a little extra space in the suitcase, but they’ve helped me look prepared on several occasions. I’ve used these sheets in training sessions and with team members and executives during last-minute strategy meetings while on the road. The Train Like A Champion blog is published on Mondays, Wednesdays and Fridays. These brief “Training Tip” posts are a series of quick reference tips that are published while your beloved Train Like A Champion blogger is currently enjoying a little vacation. The more in-depth posts will resume again in August. Thanks for the comment, Scott. I have never thought of using tables as wall space – I love that idea!